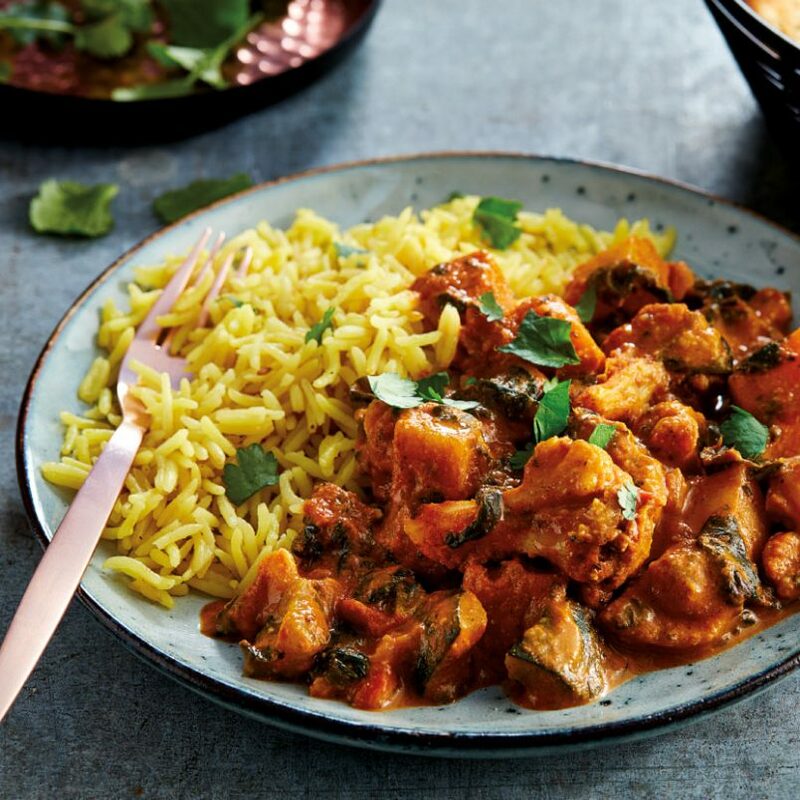 Whether you’re a vegetarian, taking part in Meat-Free Monday, or you’re just craving some exotic spices, then this is the dish for you! 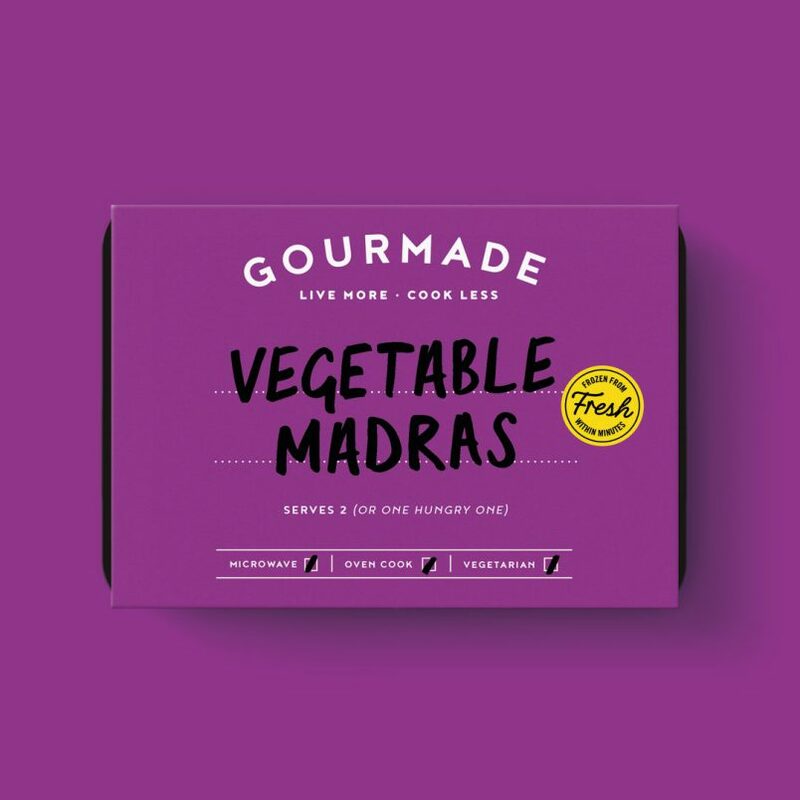 Our Vegetable Madras is packed full of delicious veg and spiced with turmeric, coriander seeds and garam masala for a medium-hot heat. The warming flavours and hearty, chunky texture of this dish makes it very special. We love to put natural yogurt on top and serve with a side of Pilau rice and mango chutney.…enjoy! Potatoes (12%), Chopped Tomatoes (10%), Onions (10%), Courgettes (10%), Butternut Squash (9%), Water, Coconut Cream [Coconut, Water], Cauliflower (8%), Spinach (5%), Rapeseed Oil, Tomato Paste, Madras Paste [Water, Ground Spices (Cumin, Coriander, Turmeric, Chilli, Cardamom, Ginger, Paprika, Cinnamon, Fenugreek, Nutmeg, Clove), Salt, Sunflower Oil, Yeast Extract, White Wine Vinegar, Tomato Powder, Garlic Powder], Whipping Cream (Milk), Almonds, Ground Coriander, Sugar, Vegetable Stock [Dried Vegetables (Onion, Leek), Salt, Sugar, Sunflower Oil, Turmeric, Black Pepper], Ginger Puree, Garlic Puree, Lemon Juice, Modified Maize Starch, Ground Paprika, Ground Fenugreek, Ground Cumin, Salt, Garam Masala [Coriander, Cumin, Black Pepper, Allspice, Cardamom, Turmeric, Nutmeg, Ginger, Bay, Cloves, Cassia, Cayenne], Chilli Powder [Spices (Cayenne, Paprika, Cumin), Salt, Garlic Powder, Oregano], Ground Turmeric, Ground Cardamom.